Have one for Sale or Trade? Author: Phillip Spera, Andrew Zartolas, Jr. 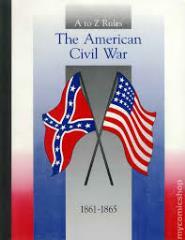 The A to Z Rules for the American Civil War is the second in series of fast playing rules for 15mm and 25mm miniatures. It is compatible with all basing systems and can be played on a regimental or brigade level. It will enable you to lay a short scenario in three hours or recreate a massive day long battle in brigade scale within five to six days.